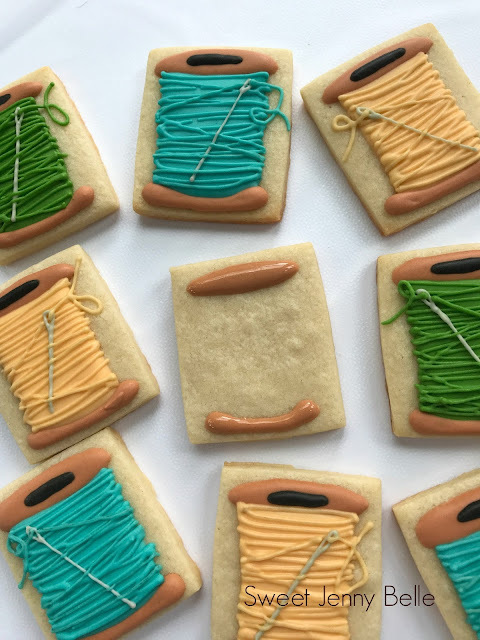 Before I fell head over heels in love with cookie decorating, I spent the majority of my free time quilting and hand sewing. My studio was full of a rainbow assortment of fabric and matching thread. 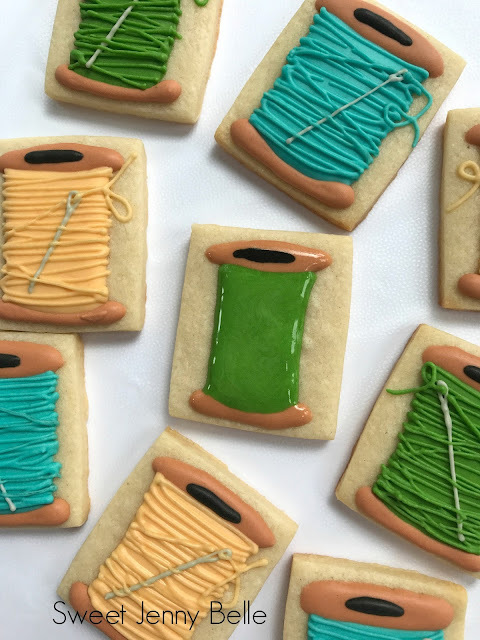 I still love quilting, but share the time with decorating cookies. This past week a new friend encouraged me to join the Portland Modern Quilt Guild. I was a member of the SLC chapter and it sounded like a great way to get back into my fabric stash. What a fabulous group of quilters and I can't wait to free my sewing machine from the moving box. This past week was also Quilt Market - a time when designers reveal their new fabrics for the season. It seemed like the perfect time to create sewing inspired decorated cookies. These cookies are pretty easy and I have a video at the end showing you my process. As always, if you have questions, drop me a line or comment! First ice the top and bottom of the thread spools in warm brown. The top part is a long skinny oval and the bottom is almost like a smile. Be sure to use a toothpick or scribe to spread the icing around, this also helps prevent catering. While the brown icing is still wet, add a small black oval on the top of the spool. This is to give the illusion of the thread spool hole. You can also paint it with black food coloring or use a dark brown gel color. I chose to add my base thread color while the spool top and bottom were wet. You could wait till they dry or place them in the dehydrator to crust a bit. However, I didn't find it problematic to work with wet by wet. My thread spool is centered and doesn't reach the wood ends. If your lines are not perfect, don't fret. A lot of the base will be covered with "threads" in the next step. To create the look of individual threads, I used the same flood icing but with a PME tip 00. This tip is super tiny, but with a flood icing it should come out with no issue. You could use a thicker piping icing if desired. Ice strings of "thread" back and forth on the spool; the frosting lines can be parallel and crisscross. Now it's time to add the needle, with your grey icing frost a line cross the spool with an eye opening at the top end. Complete the look by icing just a few threads across the needle and one threaded through the eye. Aren't these so fun? 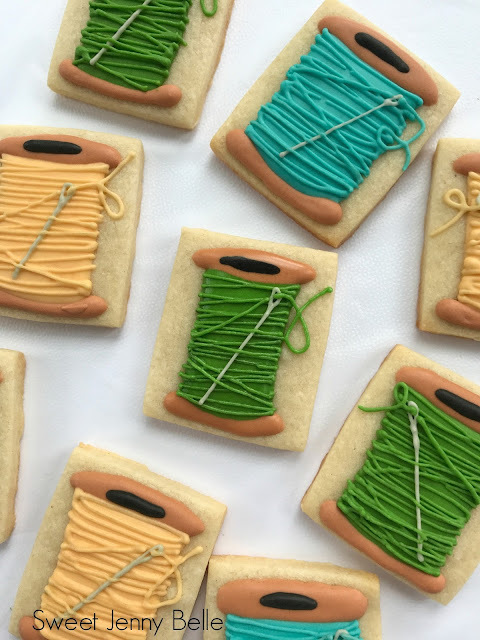 They would be great paired with some button cookies too! 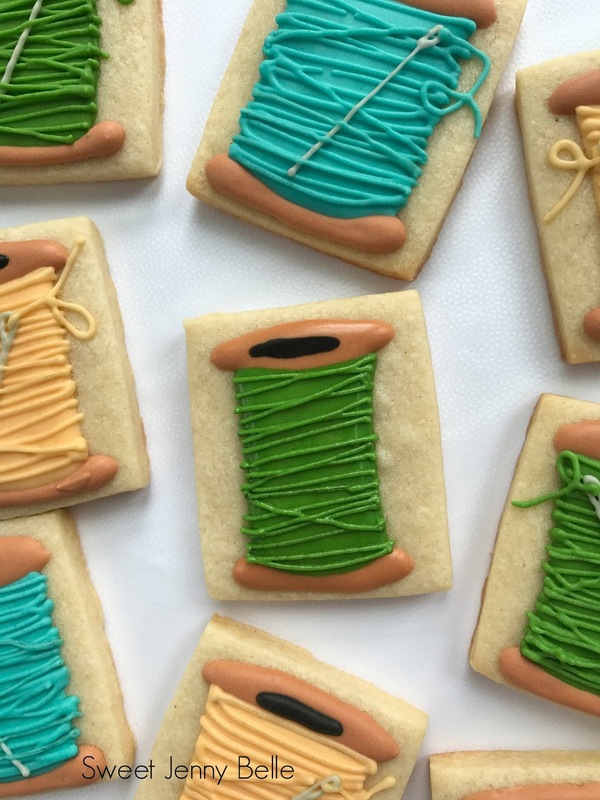 I hope you enjoy my little video of how I create these quilting thread decorated cookies. 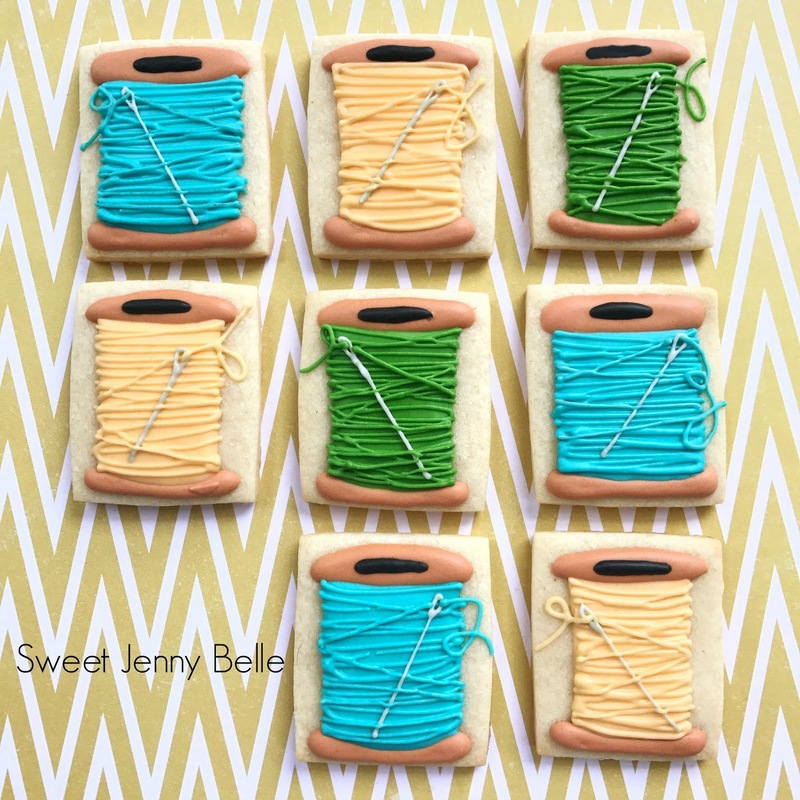 These are pretty easy and are sure to delight the sewing lover in your life. I think these cookies would be super fun as a cupcake topper too! 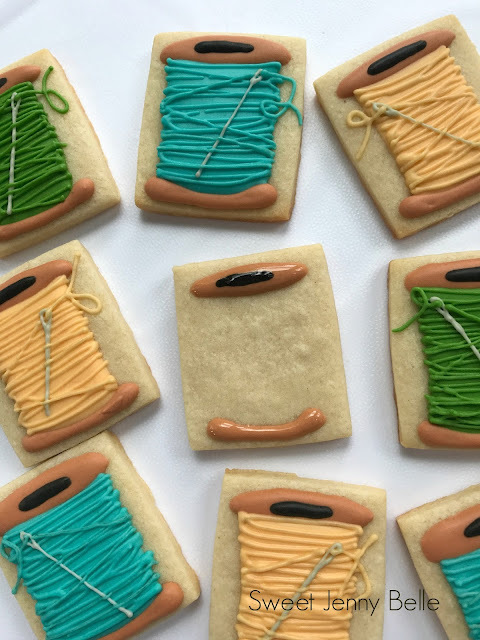 Happy sewing and eating my friends!